Will I owe taxes on the amount of my student loan debt forgiven? What will my student loan forgiveness tax burden be? 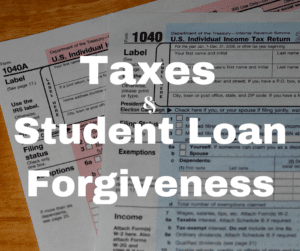 Is the debt forgiven tax free for student loan forgiveness? So, will I pay taxes on my student loan forgiveness amount? The answer is simple: all student loan FORGIVENESS programs are tax free. However, the problem comes in how your define “student loan forgiveness”. There’s a difference here that matters a lot. So let’s look at the taxability of each program. Federal student loan forgiveness programs are tax free. These plans include PSLF (Public Service Loan Forgiveness), teacher loan forgiveness, law school loan repayment assistance programs, and the National Health Service Corps Loan Repayment Program. When discussing “Student Loan Forgiveness” programs, these Federal programs are what are typically being referred to. Sometimes student loan scam companies try to sell victims on student loan forgiveness, but what they are really peddling are student loan repayment plans that could include student loan forgiveness at the end. These plans are taxable and are different from Federal student loan forgiveness programs. Student loan repayment assistance programs vary when it comes to taxability of the debt forgiven. These include many of the programs I list here: Student Loan Forgiveness by State. For these programs, you have to check with the program itself and determine whether you will owe taxes on the amount forgiven. For example, law school repayment assistance is typically tax-free. However, some state-based programs are tax-free on the state level but may be subject to Federal income tax. Each program is different, so make sure you check. If you receive a cancellation or discharge under these circumstances, you will pay taxes on the amount of the student loan debt forgiven. Note: Starting in 2018, President Trump made death and disability discharge tax-free. Finally, student loan forgiveness programs that are part of repayment programs such as IBR or PAYE (where you get your balance forgiven after making 20 or 25 years of payments) is considered taxable income. We actually break down the taxability of these programs here, and why it still makes sense: Secret Student Loan Forgiveness Programs. As you can see from those examples, just because you pay taxes on the amount forgiven doesn’t mean that it’s a bad deal. In fact, you’ll always owe less in the end by using these programs versus not using these programs. For many borrowers, the though of paying taxes on any amount forgiven can be daunting. However, you shouldn’t worry about what the tax implication will be years down the road. The best thing you can do is pick a student loan repayment plan or pursue a forgiveness path that works for your. There’s a lot of things that can happen between now and forgiveness, including changes to the law. For example, Trump just made death and disability discharge tax free starting in 2018. It can change! Furthermore, you might not even owe taxes due to insolvency. This is a complicated tax process, but we break it down here: Student Loan Forgiveness and Insolvency. Have A Question About Loan Forgiveness? Have a question about taxes and student loan forgiveness? Make sure you stop by our new Student Loan Forums and ask your question! The parent plus loan I have is from a school which signed my daughter up without my presents, my daughter really didn’t know about what all loans they were. I never signed anything, they went in and changed the. Fsafa password and done what needed to be done and signed her up. I’ve tried to explain this but doesn’t matter who I talk to. Do you know any other company besides Ameritech that may help with parent plus loans. They do not serve Ohio. I am looking at 112,000.00 in parent plus loans and could really use help. I am a parent whose child took the loan out with my name as the main borrower, thru Nelnet. When the loan was applied for I was not working but caring for an elderly family member. I explained this to them at that time. They based it of my previous years taxes rather than listen to what I was telling them. I cared for this family member for several years. When I filed taxes I could only claim about 7k. But still claimed. The loan was turned over to the gov’t. Who has taken my taxes every year since. I am now currently working and want to pay this off but need to figure out just who to make the payments to. The loan was originally 5k but since has increased every year to now become between 8-10k. Any info would be much appreciated. Sadly, many repayment plans based on income usually are low payments that cover only part of the interest and the principal remain unpaid. At the end, the debt would be higher than the original. For example, the original debt was 80,000 and the repayment is only 500 monthly based on income. The actual payment should be 1000 to cover the interest and part of the principal in order for the debt to decrease, therefore the 500 are applied to the interest only. At the end of 20 years you owe 300,000. Then you are “forgiven” and you owe 33% of 300,000 to the IRS. That is 99,000 dollars in taxes. You are correct, with a big exception: insolvency. We estimate that around 80-90% of borrowers experiencing forgiveness will be insolvent and owe nothing in taxes for their debt. In your scenario, do you think that a borrower who owes $300,000 would also have accumulated $300,000 in assets if they couldn’t afford their payments and were only making income-driven payments? In most scenarios no – so they wouldn’t owe any taxes. In most cases, where borrowers are NOT insolvent and will owe taxes, their total student loan liability will be in the $30,000 to $50,000 range. In that scenario (let’s use $50k), it would put the borrower into the 24% tax bracket. And assuming they have no adjustments or tax credits, that would put the added tax liability at $12,000. First off, that’s a significant savings over the student loan debt. Second, there isn’t really an alternative if they couldn’t afford their payments to being with. Remember, if a borrower is on an income driven plan, it’s because they don’t make enough income. The only real alternative is earn more (and get off the plan and see no forgiveness), or default – and see wages garnished and loan balances grow. With that being said, if the borrower can’t afford the $12,000 in additional liability, there are multiple payment options to the IRS and they can pay that debt over the next few years (and it’s much lower than their old loan payment). So, if they simply put their old payment towards this new liability, they can make solid progress in a relatively short period of time. Hello, so I’m in a interesting situation. I currently have $485,000 in debt from dental school and the interest accruing on it over the past 4 years of school (the most expensive professional degree now!). I am between the REPAYE and PAYE options. The pros I see from PAYE are the 10% of income and forgiven in 20 years instead of REPAYE with 25 years at graduate loans. I realize the REPAYE they will subsidize 50% of the interest after the first 3 years, but in my case with the whopping amount of debt I am in, I don’t think it will ever get paid off. My payments will never be high enough to take down the interest that is accruing on these huge loans. I have interest rates from 5-7.2%. Even if my income were to get to $200,000 I still would not pay it off in time. So my dilemma is should I go for the REPAYE and get the subsidy on interest even though I’ll probably never pay it off and have to wait 25 years to get it paid. Or do the PAYE at 20 years and get it done sooner but without subsidy. In both situations I believe I am going to pay a huge taxable income on these and that really worries me. Obviously the PAYE would be a higher taxable income if the interest isn’t getting subsidized. This is a very tough call because I don’t know if I should really try to get it all paid down and make bigger payments than are asked, or just ride out at my low payments each month even though the interest will grow tremendously and pay the forgiveness on a taxable income. I don’t think most borrowers are in my situation with this large of a debt so I feel like a lot of the scenarios don’t apply to me. You should consider talking to a financial planner. The Student Loan Planner deals with borrowers like you almost daily (doctors, lawyers, dentists, etc.). They can run the scenarios with you, including beyond just your loans. It’s a tough call, but getting professional help is advisable. Can you state the specifics regarding President Trump making death and disability discharge free? I would like to confirm this information as I have had a disability discharge and have been waiting for the IRS to contact me about paying taxes. It’s all covered here: Trump Tax Reform and Student Loans. My daughter has a $90,000 student loan debt. She teaches in Renne, France at the University. Does she qualify for any loan forgiveness or not , because she resides outside of U.S.
No, just because you live outside the US does’t change anything. She still owes the debt and needs to make payments. It’s actually probably worse for her because if she taught in the U.S., she could qualify for Public Service Loan Forgiveness and get her loans forgiven. I cannot afford to pay the amounts they are telling me I have to pay a month for parent plus loans. My daughter in enrolled online at penn foster. I was told we could defer but now they say I can’t. Ready to look into bankruptcy Caus they won’t help me. What do I do? Sadly, you 99.99% of student loans aren’t dischargeable in bankruptcy. So, you need to start working on the loans now. Here’s a guide specific to Parent PLUS Loans: Options For Your Parent PLUS Loans. Is the forgiven amount after completing an income based repayment plan taxable just as a one time payment, or does it become taxable income for every year after that?